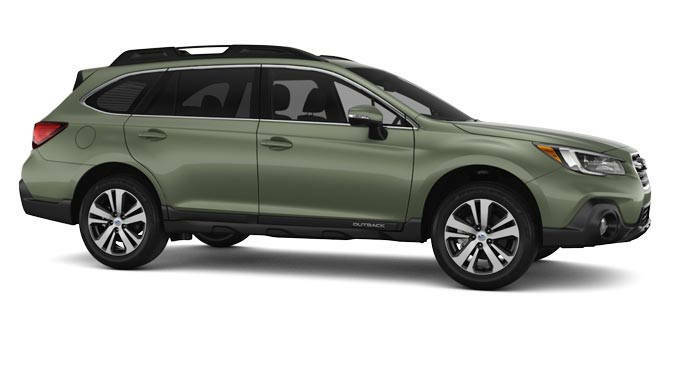 The Subaru Outback 2018 is a 5-passenger wagon that is available in 6 trim levels – 3.6R Limited, 3.6R Touring, 2.5i, 2.5i Touring, 2.5i Premium and 2.5i Limited. The base models features the essentials such as Bluetooth and roof rails, while the Limited and Premium trims have extra conveniences like satellite radio and heated seats. 3.6R models have similar conveniences, but are run by a powerful 6-cylinder engine. The 2018 Subaru Outback’s all-wheel-drive system as well as hill descent and hill hold control help you tackle any beaten path. The car has standard roof rails, 60/40-split rear seats and 73.3 cubic feet interior cargo volume, so you can bring your supplies without any problem. The Outback’s improved infotainment system supports Apple CarPlay and Android Auto. The new headlights are equipped with daytime running lights (LED). The rear, grille and front fascias have been revamped for a stronger look. Interior cabin noise is greatly reduced thanks to the car’s latest side mirror design. The Outback also boasts a new steering wheel design and center console. The 8" and 6.5" infotainment offerings are simpler, easier to use and more responsive than before. The car has large toggles and buttons to streamline operation. The new screen display and the HVAC settings make it easier to control cabin temperature. The Subaru Outback 2018 also features USB ports that can entertain passengers. The car is available with either a 3.6-liter flat-6 engine that makes 247 lb-ft torque and 256 hp or a 2.5-liter 4-cylinder engine that produces 174 lb-ft torque and 175 hp. Both engines give power to all 4 wheels via an upgraded CVT that provides a smoother response in 4-cylinder models. Its throttle feel is more consistent than before. The Outback’s improved suspension gives you a more enjoyable experience when driving the car. As for fuel economy, the 6-cylinder earns 22 mpg and the 4-cylinder delivers 28 mpg. The 6-cylinder delivers that signature boxer growl you’re looking for. The 4-cylinder may not excite you, but it is very smooth when it comes to power delivery. One of the best things about the newest car from Subaru is that it offers a great driving position and exceptional safety ratings. It offers 8.6" of ground clearance that can deal with various obstacles on the road such as huge rocks, steep declines and inclines as well as banked turns. The car has excellent off-road visibility and a spacious cabin. Its cargo-loading and roof heights are also lower than that of most SUVs. It has no on-board Wi-Fi. Acceleration is not really great, particularly with the 4-cylinder engine. However, if you need an adept crossover SUV that you can use in almost any situation, you can consider the Subaru Outback 2018. If you are looking for something safe and versatile, the Subaru Outback 2018 might just be what you need. It has exceptional visibility in every direction and can tackle various road obstacles, while keeping you safe and comfortable.